Through partnerships with organizations in the city we grow food and create a place where people connect. Bowery Project was one of three winners of the 2015 Toronto Foundation Vital Innovation Award given to notable interventions for the 100in1Day Toronto festival. These funds went towards building a mobile urban farm that could move during the reviltization of Alexandra Park. An urban farm of various sizes has remained in White Court Place for over 3 years. Bowery Project through the help of the local community and a Canada Summer Jobs student, has been growing vegetables and herbs for meals prepared at the Alexandra Park Community Centre (APCC) Kitchen by summerlunch+, a TIDES Canada charity providing lunch for 100 summer camp kids; youth and senior residents who are newcomers, visible minorities and/or people living in poverty. Last year 100 campers came to bi-weekly hands-on educational urban farm workshops to harvest for the APCC kitchen. Bowery Project was the recipient of an Ontario Trillium Foundation grant in 2015. This grant along with sponsorship from Tridel and Toronto Community Housing (partners in phase 1 of the revitalization of Alexandra Park) supported our first urban farm. We transformed the vacant space behind the Vanauley Street YMCA youth shelter within the Alexandra Park neighbourhood. Over those two years the YMCA urban farm of 1500 milk crates grew over 800lbs of organic produce for the local community - through both Vanauley St and the Metro Hall food programs. We also offered volunteering opportunities and educational workshops to the YMCA participants, and other outside organizations including the IB Association and Soho House. The executive director of the Scadding Court Community Centre Kevin Lee graciously housed our Alexandra Park farm for a season. 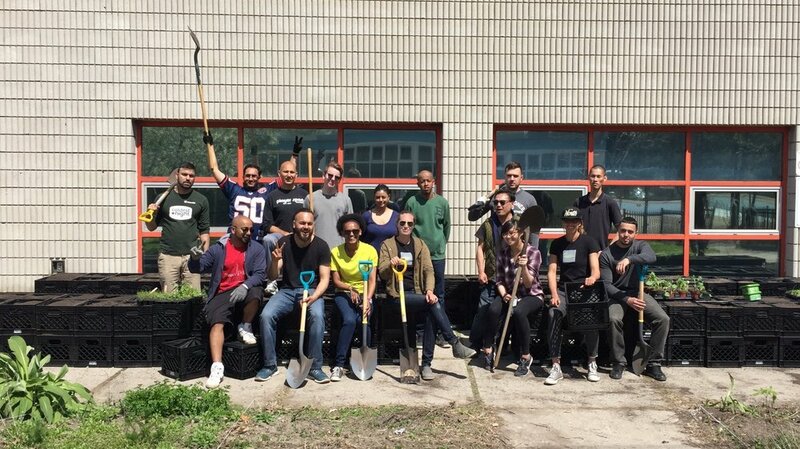 We engaged people from Toronto Community Housing and Scadding Court to set-up and plant seedlings. Staff on-site volunteered to take care of the urban farm.